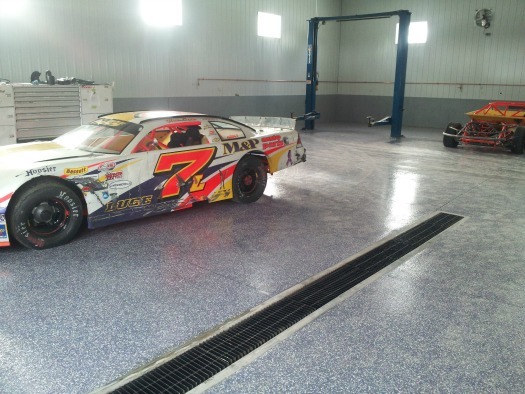 Concrete Floor Epoxy in Maine installed by Day's Concrete Floors, Inc. 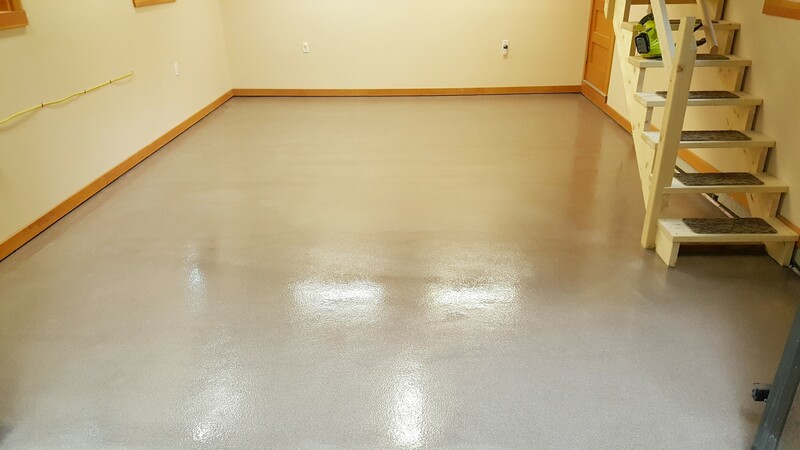 Concrete floor epoxy is a coating that's very durable, long lasting, easily maintained, chemical resistant and can be quite decorative. 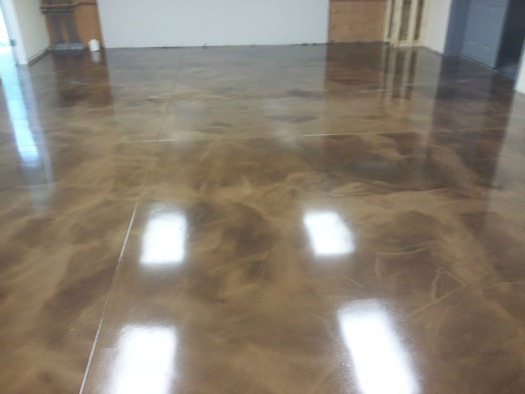 Day's Concrete Floors, Inc. owner, Mike Day and his employees have been professionally trained to use Dur-A-Flex, Inc. and Elite Crete's 100% solids 2-part epoxy concrete floor paint. 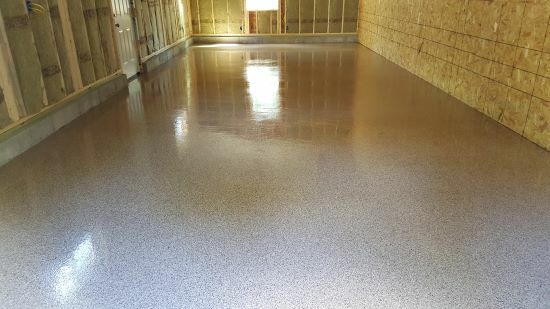 We've had many hours of training using their epoxy coatings and have successfully installed epoxy floors in garages, dog kennels, office buildings, restaurants, and commercial buildings all over Maine. 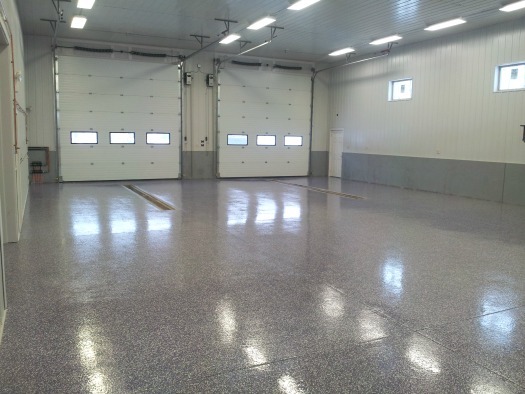 Garage Epoxy floor in Lisbon, Me. Epoxy floor in Lewiston, Me. 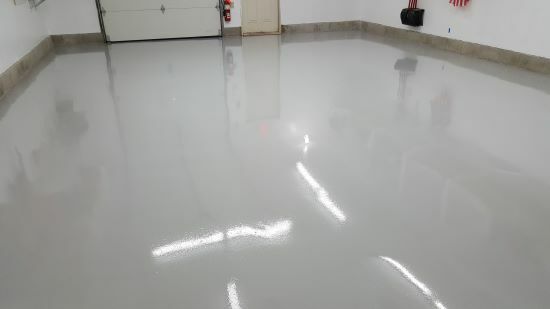 Garage Epoxy Floor in Winthrop, Me. Dog Kennel floor in Farmington, Me. Epoxy garage floor in Oakland, Me. 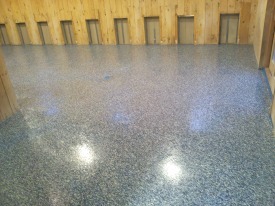 Epoxy garage floor in Boothbay, Me. 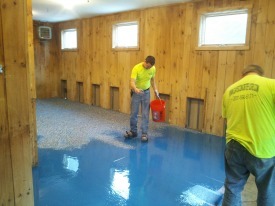 Garage Epoxy Floor Scarborough, Me. 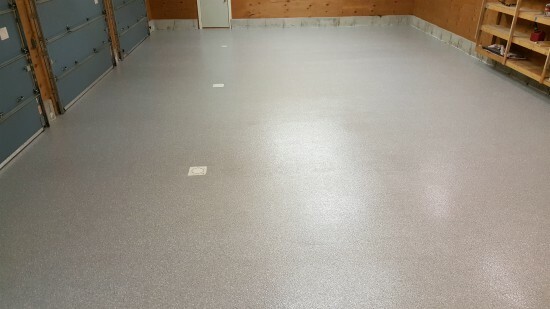 Garage Epoxy Floor in Topsham, Me. 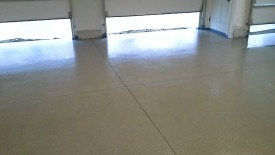 This concrete floor epoxy coating was installed in a commercial garage. The owner, Glen Luce of Glen Luce Racing in Turner, Me. 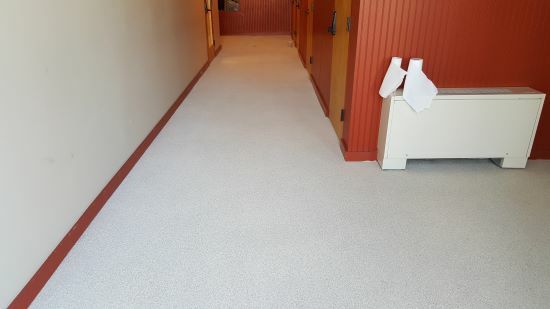 wanted a nice looking, durable, chemical resistant floor that is easy to keep clean. Epoxy floor in Turner, Me. This was a regular concrete floor before we started. We used a shotblaster to profile the concrete then cleaned the floor and applied a moisture blocker. A pigmented epoxy was rolled on and the decorative vinyl chips were broadcast into the epoxy while it was still wet. 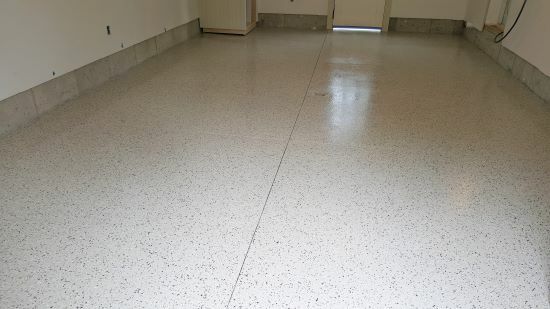 After the epoxy dried we sanded the surface, cleaned again, and applied a clear epoxy concrete sealer for a topcoat. The picture below is our reflector enhancer epoxy coating. If you're looking for something unique and decorative, this is the epoxy flooring you want. See more of this floor we did in Falmouth, Me. by clicking here. On this concrete floor we're applying a blue epoxy base coating and I'm broadcasting decorative chips into it. 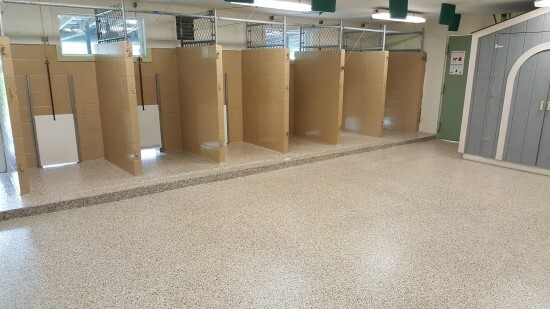 This floor is being used for a dog kennel in Brunswick, Me. We used an epoxy concrete sealer for the topcoat then applied a urethane topcoat for the final finish. 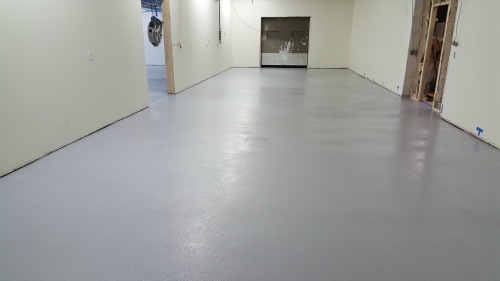 On this office building's concrete floors, we're applying a reflector enhancer metallic epoxy coating. 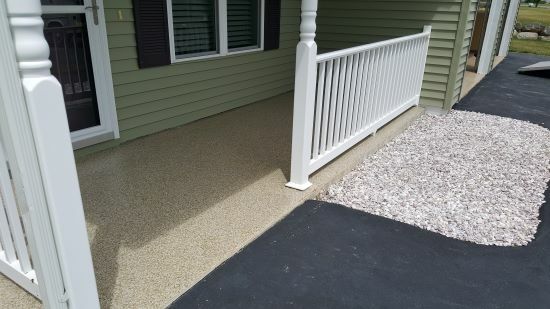 Reflector enhancer is a metallic additive we mix into the epoxy that gives the epoxy a translucent look like concrete stain. There's many colors to choose from, this one is coffee, more than one color can be used at the same time to create some great looking epoxy floors. Epoxy floor in Livermore, Me. 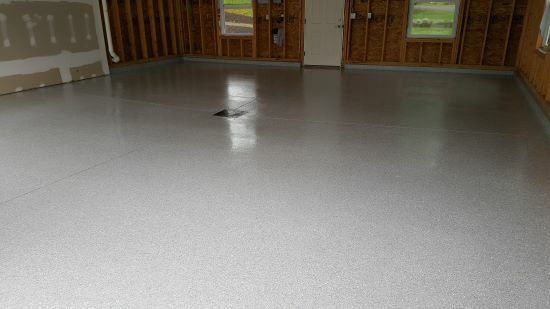 If you're looking for flooring that is very durable, wear resistant, chemical resistant, easily maintained and very decorative with many different color options then a concrete floor epoxy paint is a great choice. Here is our solid color epoxy color chart. Here is our reflector epoxy color chart. To choose decorative color chips look at this color chart. 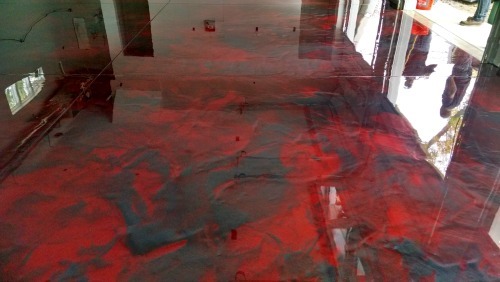 Watch a video of us installing a decorative chip epoxy floor. 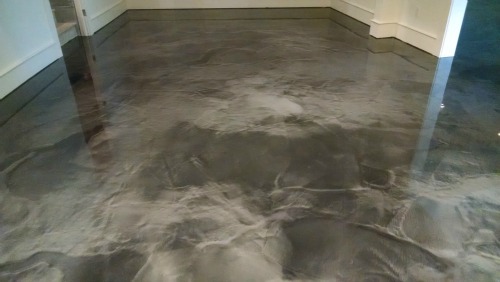 Here's a designer reflector enhancer epoxy floor we installed in Livermore, Me. 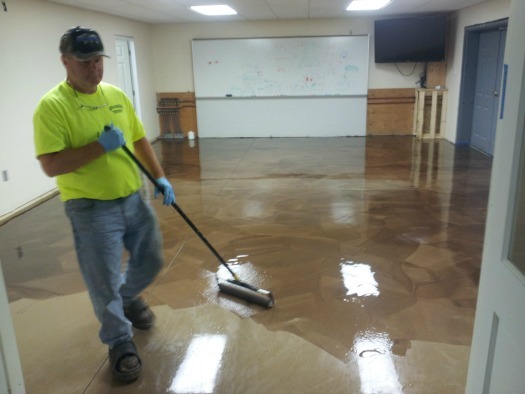 Day's Concrete Floors, Inc. is Maine's Dur-a-flex and elite crete epoxy flooring contractor for cities and towns in central and southern Me. Give me a call or "request an estimate" for a free quote today.